The Hubble Space Telescope stands tall in the cargo bay of the space shuttle Atlantis following its capture and lock-down in Earth orbit on May 13, 2009 during the STS-125 mission. In the last 20 years, the Hubble Space Telescope hasrevolutionized the way humanity views the universe. In many ways, it may havebeen the most influential telescope since Galileo peered at the night sky withone four centuries ago. NASA launched the Hubble Space Telescope, a joint effort by NASA and theEuropean Space Agency, on April 24, 1990 aboard the space shuttle Discovery tomuch fanfare that soon fell flat. A flaw in the telescope's optics gave it blurryvision and turned the iconic space telescope into a potential boondoggle inorbit. But Hubble was built to be upgraded by astronauts riding NASAshuttles. 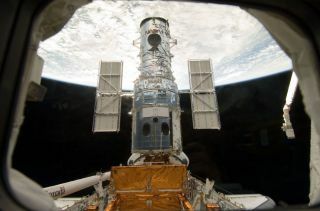 In 1993, the first crew of space mechanics fixed the Hubble telescope'svision flaw, with four more maintenance and repair missions to follow. NASA's last trip to Hubblewas in May 2009, when the crew of shuttle Atlantis paid one final service callto the orbital observatory. They replaced Hubble's old batteries and worn out parts,revived broken cameras never designed to be fixed in space and added two newinstruments. The result: A Hubble Space Telescope more powerful than ever. Scientists have dubbed the suspected culprit behind thisaccelerated expansion "dark energy," and it is now thought to make up74 percent of the combined mass-energy in the entire universe. In comparison,ordinary matter accounts for only 4.6 percent. "The discovery of dark energy was extremely surprising, andis I think the greatest discovery it helped make," said astrophysicistMario Livio at the Space Telescope Science Institute, the scienceoperations center for the HubbleSpace Telescope. "And we still don't have any idea really what it is.The nature of this dark energy is at some level the biggest problemthat physics is facing today." And Hubble did not only make the universe seem a larger place byshowing us it was growing ? the orbiting telescope also hinting there was a lotmore for us to learn. "It'sgenerated a tremendous sense of humility because we've discovered how weunderstand so little about the universe, from dark energy to dark matter to howgalaxies can change across 13 billion years of cosmic history," said SpaceTelescope Science Institute director Matt Mountain. "It's completely changedour perspective on the universe." When Hubble was launched, one of its main missions was discoveringwhen the universe was born. Before the orbiting telescope was deployed, it washighly uncertain as to how old the universe was, which could lead to laughablepossibilities, such as stars older than the universe. Bymeasuring where distant galaxies are more accurately than ever before and howfast they are moving, Hubble greatly narrowed down the rate at which theuniverse is expanding, helping refine estimates of the universe's age down toroughly 13.75 billion years. However, by solving the mystery of the universe'sage, it unexpectedly turned up an even more profound enigma ? the universe'sexpansion is inexplicably accelerating, instead of slowing down as one might expectdue to the pull of gravity from galaxies. There were earlier suggestions that a "cosmologicalconstant" might exist with the effect of a repulsive force that actedagainst matter's gravitational attraction, with the most notable proposalcoming from Einstein. Before Hubble, however, "without observations, noone took those speculations particularly seriously," Livio said. Solving the mystery of darkenergy could revolutionize physics. It has prompted new theories regarding theorigin of the universe, such as one where clashing membranes of reality triggerendless cycles of cosmic death and rebirth. It has also prompted speculationregarding the universe's fate, raising the possibility that dark energy endsthe universe in a Big Rip. Still, much remains unknown about dark energy. One idea is that itliterally comes from empty space ? from energy that quantum mechanics theorizesshould exist in vacuum. The problem is that preliminary calculations as to how strong darkenergy might be if it was a consequence of vacuum energy were an astounding 120orders of magnitude greater than we actually see with dark energy. That is a 1with 120 zeroes behind it. "Even if you refine estimates further, you still miss themark by more than 50 orders of magnitude, which is again ridiculous,"Livio said. "Another possibility is that it's some sort of field, but wedon't understand why that field should be there, and whether it might berelated in some fashion to what caused inflation of the universe at its verybeginning. A third possibility is that there's really no dark energy at all,but that we have to change our theory of gravity, that Einstein's theory ofgeneral relativity is not correct when we get to larger scales of theuniverse." In each of those cases, "we're talking about a fundamentalchange in our understanding of physics, the very basic physical theory thatgoverns the universe," Livio noted. "It'sfair to say that when you look back at history, Hubble will have had as muchimpact as Galileo'stelescope," Mountain said. "No telescope has had the kind ofpublic draw that Hubble's had. It's the way the public gets to participate.Everyone gets to see its pictures ? you don't have to know how to read Latin toread Galileo's 'Starry Messenger' to find out what he was up to." Agreat deal of Hubble's revolutionary impact comes from its staying power. "It's been serviced five times, and each such mission has allowed Hubbleto renew itself with new instruments that make it almost a new telescope eachtime, so that it can keep making new discoveries," Livio said. Afterthe last mission that serviced Hubble, "we expect it to last at leastanother five years," Mountain said. "In principle, if we're lucky andsmart, we may be able to celebrate Hubble's 30th birthday."